Earlier today, we were cruising along providing our 3500+ social media followers/fans with regular updates as Tornado Warnings were issued for the metro area around noon. A severe line of storms had crossed through most of Shelby, Desoto, and Tipton Counties and was heading into Fayette County when the power flashed, then went completely out, at Cirrus Weather Solutions in Bartlett. We weren't the only ones. MLGW reported a peak of 68,000 customers without power just after the storm. 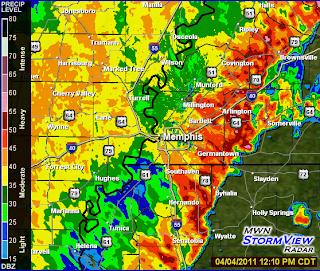 Last StormView Radar image provided just after the power loss at MWN. While we have backup facilities in place to cover short duration outages without significant impact to our users, this particular outage turned out to be just over 4 hours long, as power was restored in great fashion by MLGW about 4:20pm. There were still about 50,000 without power at that time, so we were in the first 30% of customers to be restored. We can't thank the utility crews and operations folks at MLGW enough for their dedication to restoral of service throughout the Memphis area. They are working around the clock and we appreciate it! Cirrus Weather Solutions' servers feed data to our users, including current conditions from Bartlett, StormView Radar, severe weather alerts to @shelbyalerts on Twitter and via e-mail to hundreds of subscribers, and the severe weather warning map. This data is displayed on MemphisWeather.net, the MWN iPhone and Android apps, MWN Mobile, and also JacksonWeather.net. In addition, real-time updates from MWN staff to Facebook and Twitter followers originate from our home office and we are also closely monitoring weather data as it arrives to provide you with the latest updates. So, when the power goes out for more than a few minutes, we are severely handicapped. Smartphone updates only go so far! 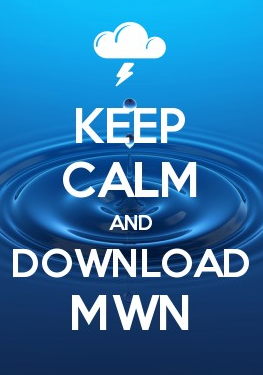 While limited updates continued via smartphone to Facebook and Twitter, we took measures to update MWN and our users on our status and limited capabilities. Within 15 minutes of power restoral, all of our data feeds were restored and information was again populating the web, apps, etc. We wish to take this opportunity to sincerely apologize for the difficulties we experienced today in delivering the timely and accurate information you have come to rely on from MWN. Power outages are not within our control, but our response to them is. A thorough review is underway to determine how we can better respond in these circumstances and ensure backup procedures are in place and fully tested. We can only assure you that we will do better next time. Thank you for placing your trust in us to provide you with the best weather information possible. Unfortunately, interruptions in service are part of doing business strictly via the web and electronic means. We remind you (as we did earlier today) to read and understand our severe weather policy, which includes the possibility of outages. One thing that might help, even with power outages--Some of use have limited internet access at work. Smart phone text updates can be very useful. For instance, if there is a tornado warning and where that warning was issued for is essential and could be twittered. I think there were at least 2 warnings in this morning's events.Maps and radar are nice, but, without all that fancy stuff, just plain text would be extremely useful. I use (and used today as well) Twitter and Facebook to send updates throughout storm events. You can follow MWN on Twitter (@memphisweather1) and Shelby Co. weather alerts from the NWS are sent via @shelbyalerts as well. We're also on Facebook and update frequently. I also encourage you to check out our new apps - they have the @memphisweather1 Twitter feed built in, plus you get some graphics on your smartphone.